Jake Burt is the author of Greetings From Witness Protection! (Feiwel & Friends), a middle-grade debut selected for the Summer/Fall 2017 Indies Introduce program and an Autumn 2017 Kids’ Indie Next List pick. 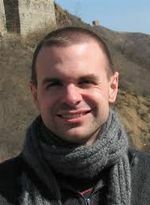 A native of Columbus, Ohio, Burt now teaches fifth grade English in Hamden, Connecticut. Here, Burt and Savage discuss his debut. Lauren Savage: How did you come up with the idea for Greetings From Witness Protection? Jake Burt: I’m a teacher, and every fall I get to meet a brand-new class. One of my favorite parts is seeing how the students gradually become comfortable in their new classroom. At first, they’re quite reserved, nervously scoping out the room and testing the boundaries of the fairly draconian guy that seems to be in charge of the place. Once they’re over the novelty of me (a process that, admittedly, doesn’t take long), they transition to establishing their personalities in this new space. In essence, it becomes a desperate sort of performance of self — a scramble to figure out where they fit, if you will. 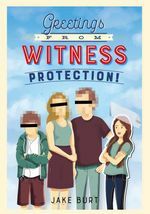 The notion of a middle-school girl in witness protection came from imagining how one might complicate that process of performance. I asked myself, “For whom is this performance the most fraught?” and “Is there someone out there who couldn’t perform herself?” The answers all led me to a kid in the witness protection program. I particularly liked how putting Nicki through that wringer magnified the middle-school tension between the desire to stand out and the need to fit in. LS: How long did it take you to write the book? JB: I started storyboarding it in early 2014 (the year in which the novel is set). The first draft took a couple of months to write, but, of course, the revision process took much longer. From genesis to publication in October 2017, the entire process will have taken three years. LS: What made you decide on featuring a girl as the main character? JB: My characters tend to leap into my brain fully formed. It might sound hokey, but the part of writing I most adore is meeting them and listening to them tell their stories. Nicki was particularly talkative, and from the very first moment, she was, well, a she. The thought of making a boy the protagonist never even crossed my mind. In retrospect, if I had to psychoanalyze the decision, I think there are a couple visceral reasons. The first is that I have a daughter, and so I found Nicki’s massive rift with her biological family, and particularly that with her imprisoned and absentee father, to be personally compelling. The second is that I’ve been blessed to be surrounded by fierce, strong women my entire life, and I figured that if anyone could survive what I planned to put my main character through, it’d be one of them. Greetings From Witness Protection! by Jake Burt (Feiwel & Friends, Hardcover, Middle Grade, $16.99, 9781250107114) On Sale Date: October 3, 2017. Learn more about the author at jburtbooks.com.